Written by academics under the supervision of the experts at Microsoft, this manual gets instructors ready to teach and students ready to work on the design and implementation of security or server automation as well as SQL server activity monitoring and troubleshooting. The book provides rigorous, realistic exercises covering everything from installing and configuring Microsoft SQL Server and managing and maintaining databases and multidimensional databases, user accounts, database availability, recovery, and reporting. Instructor readiness, student software, student assessment, instruction resources, and learning validation are also covered in detail. Lab 1: Introducing the Course. 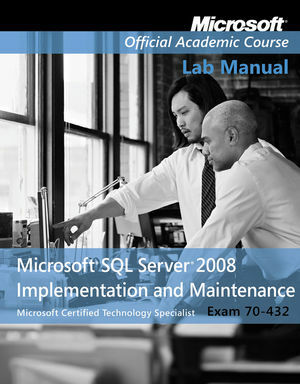 Lab 2: Installing SQL Server 2008. Lab 3: Navigating SQL Server. Lab 4: Working with Data Types. Lab 5: Working with Databases. Lab 6: Working with Tables. Lab 7: Working with Views. Lab 8: Working with Constraints. Lab 9: Working with Stored Procedures. Lab 10: Working with Functions. Lab 11: Working with Service Broker. Lab 14: Setting Logins and Roles. Lab 15: Setting Encrypted Connections. Lab 16: Backing Up and Restoring Data. Lab 17: Working with Endpoints. Lab 19: Working with Triggers. Lab 20: Working with Replication. Lab 21: Working with Indexes. Lab 22: Working with Transactions and Locks. Lab 24: Working with XML Data. Lab 25: Working with High-Availability Methods. Lab 27: Monitoring and Optimizing. Lab 28: SQL Server Management Tools.